If you have recently switched to FoxIt Reader thinking Acrobat Reader 8 is bulky and takes ages to open a PDF document, Adobe presents a new PDF viewer for you that's slim, lightning fast and sports a highly usable and attractive interface built with Macromedia Flash. Called Adobe Digital Editions, this application [or rather add-on] will probably change the way you navigate and read PDF files. Though DE would be free to end users, Adobe will display contextual ads inside the software to offset the development costs. 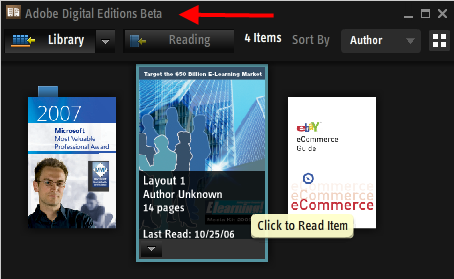 You can however opt for the premium version of Digital Editions to disable ads. The Library panel displays a thumbnail view of the PDF files and you can directly access the frequently used document properties like number of pages, author, etc. Like iTunes, Digital Editions Library will also tell the date when that PDF file was last accessed or read on your machine. The most impressive part is the reading menu. When you switch from one reading mode to another, the existing style collapses which looks very web 2.0ish. You can also adjust the content display based on your LCD screen size. For example, a single-column page can be displayed across three columns on a widescreen display. No doubt, FoxIt is quick to load but it's interface and the PDF rendering engine do not match that of Acrobat. Adobe Digital Edition will give you best of both the worlds plus a revamped interface that makes navigating PDF documents so much fun. Overall, Digital Editions is a lightweight, no-frills PDF viewer packed inside a beautiful layout and provides a good PDF reading experience if you are ready to see some non-obtrusive ads [like the you see in GMail or Google Groups]. It's not known when Adobe will show in-house ads or source the Ad inventory from existing players like Google, Yahoo or Microsoft. Related Reading: How to start Adobe Reader faster ?